You have to be a special kind of person to garden in the Great Plains; stubborn yet flexible, optimistic but cautious. The weather changes rapidly and oscillates between extremes. Wind, heat, frost, critters, weeds, and my own ambitious tendencies make it a challenging exercise to say the least. So, I took a few days off last week. Lesson learned. Do NOT ignore the garden for consecutive days in July. The tomato-jungle is visible just behind the gourds and miniature corn. 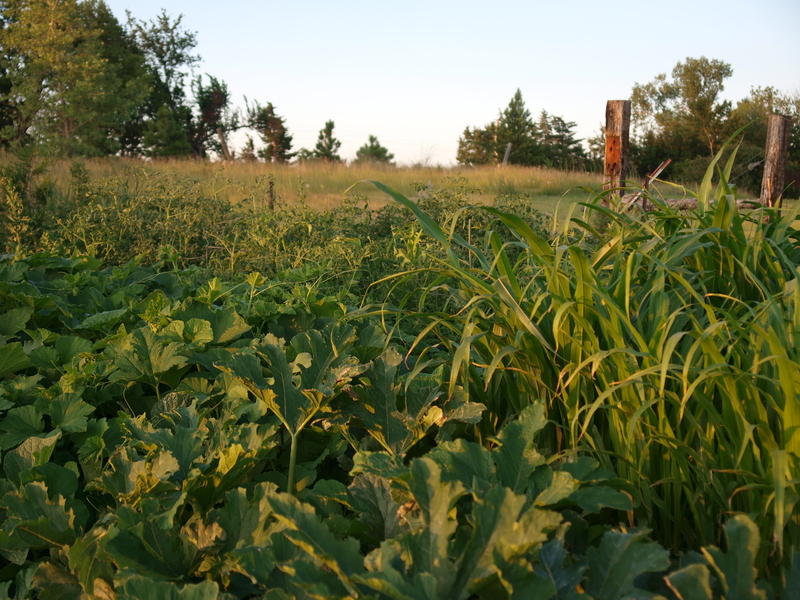 The gourds are even smothering the weeds on the edge of the garden….my well thought-out paths disappeared in a hurry! The pumpkins declared war on…everything. The cucumbers staged a counter attack. I am not sure with which side the gourds are allied, so I have decided to carry a white flag next time I go out there. Kohlrabi have grown to the size of small pumpkins (the 4-H manual says that the ideal size for harvest and exhibition is around 2-3 inches in diameter….). The peas that were supposed to stop producing in 90 degree weather did not stop….and I am scared to venture all the way over to the zucchini. Those things are prolific enough that I figure they will just fight their own way out and over to the house when they are ready. 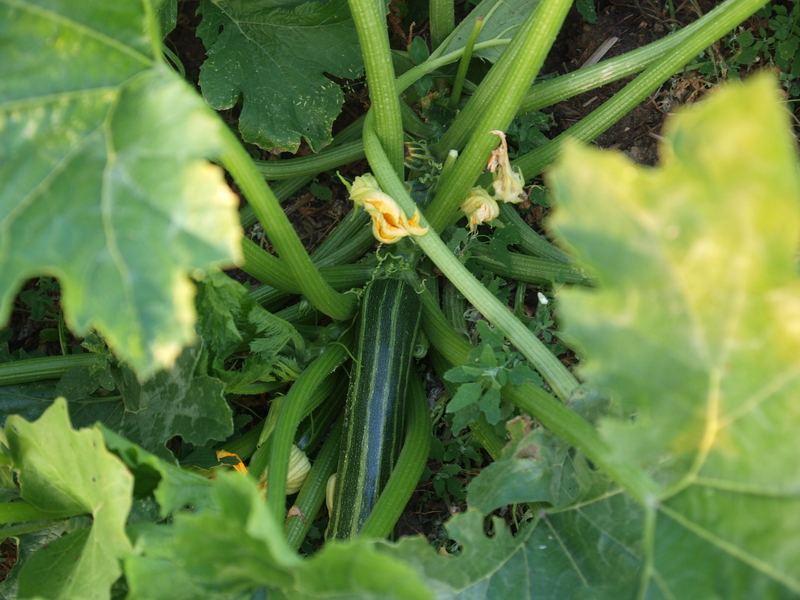 A zucchini in need of rescue from this overgrown area known as “Jill’s garden”. The beans were calling for help but I did not have a weed whacker with me so I could not free them. I suspect the potatoes are digging tunnels under the garden fence but I will be waiting for them (muhahaha). I haven’t heard from the carrots, beets, or eggplant but when I got out the binoculars, they appear to have erected a buffalobur fence, so I think they are safe for now. With the machete and a pair of leather gloves (have you seen the wimpy stuff sold in most catalogs as “gardening gloves”?!?) I am planning an expedition. The dog seems willing to go along for protection. Hubby has the weed whacker tuned up and the sons are on standby for a rescue mission, should it become necessary. Anyone have a good guess as to the state of the garden after I leave the country for 15 days in August? The veggies are SO good though–if we can find them! Yes, it is a challenge. When I plant in the spring, they look sooooo far apart…. Am I the only person on this planet that likes Brussel Sprouts?? Grilled with olive oil and sea salt or even heated in a pan with some butter., Yum. I also love Lima beans & Beets and I am not afraid to admit it !! Our garden has been a big old MEH this year. The late spring and the fickle weather of June really did us in. No beets. No carrots. Minimal Peas. Peppers are super micro size. Tomatoes? I don’t even want to talk about it. Zucchini are doing okay. Smallish but lots of them. The fishing has been great though! ‘) Lots and lots of Walleye and Crappie. You have a talent for writing and photography Jill. We enjoy your blog. Oh, how I chuckled at this! Every year I swear I will cut down on plant numbers and spacing, and every year I fail. Didn’t see a mention of melons, but wow can those things take over. I usually raise phenomenal peppers, but the guy who does our farming had the co-op spray some type of herbicide on the field corn that drifted and did a job on my peppers. Then we got hail. Frustrating year, but at least we’re getting rain! Football soon! Thanks Red! Glad to hear you are getting rain. I do have some melons but in one patch, I think the gourds must have eaten them and in the other patch…I harvested a cucumber.